Has the plain ol&apos;, angry-looking Succubus of Afterbirth been bothering you with its completely normal appearance? Worry no more, because there is now a solution for the problem you never knew you had! Install "Enhanced Succubus" today for a... different Afterbirth+ experience. Including a long-anticipated feature - a unique, redrawn sprite that is used when your character has BFFs. With appropriately upscaled features. Thanks /u/Moremonkey on Reddit for the script! 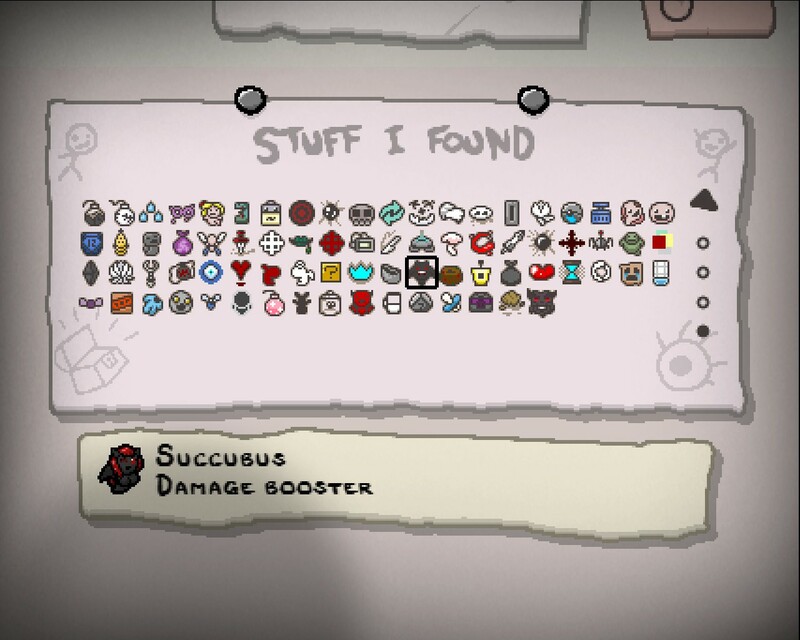 Collectible icon, collection icon (death items.png), achievement 221 graphic, animation files (regular and BFFs), main.lua for BFF feature for Afterbirth+ users. Can you update the mod on here as well? The mod has been updated to be slightly more compatible for the Afterbirth+ forgotten update (use the Steam workshop link)! Are you mentally stable? Seriously, this comment concerns me. Love this. Just small changes of the view in this game makes my want to bash my head against the macmillan wall so much harder. Please release she on steam. Could you also do something like this for incubus? It would be really great! ABSOLUTELY AMAZING!!! IVE ALWAYS WANTED AN "ENHANCED" SUCCUBUS! I&apos;ve made a CHUD adaptation of this to make the new sucqtbus icon in colour, and was wondering if I could send you this for you to post, or alternatively, to be permitted to post it myself. I might add this when it&apos;s updated with the modding API support for BFF enlarged succubus.